The day after Donald Trump was sworn is as the 45th President of the United States, hundreds of thousands of protesters took part in the Women's March in Washington, D.C., and in several other cities around the world. The national march has drawn the attention of many celebrities, including Hillary Clinton supporters. America Ferrara watched Clinton's defeat at the Democratic candidate's New York City watch party. She has called on artists to "stand together in solidarity for the protection, dignity and rights of our communities." 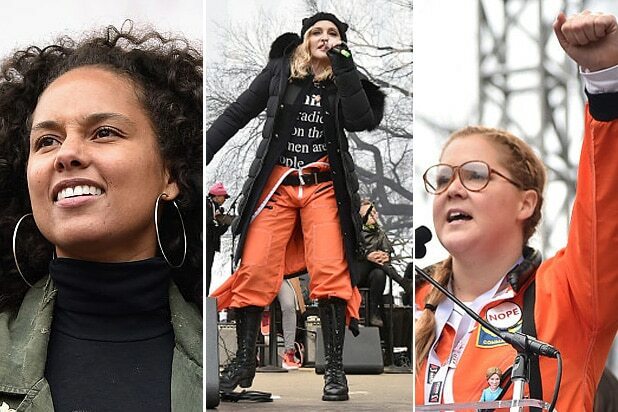 Ashley Judd, who briefly considered a Senate run in her native Kentucky, joined the rally in Washington, D.C.
Chloe Grace Moretz joined the marchers in Washington D.C.
Comedian Amy Schumer attended the D.C. March three months after Trump supporters walked out of one of her stand-up performances in Tampa. Scarlet Johansson was announced as a D.C. March participant by the event organizers. Jessica Chastain joined the marchers in Washington, D.C.
Maxwell performed for the crowd at the march in Washington, D.C.
Chelsea Handler, Maria Bello and Charlize Theron were among many stars who joined the march in Park City, Utah, on the first weekend of the Sundance Film Festival. Alicia Keys joined other stars on stage in Washington, D.C.
Madonna performed on stage in Washington, D.C. -- and dropped a few F-bombs on live TV. Janelle Monae, fresh off of "Hidden Figures," performed at the D.C. March. "Taken" star Jennifer Beals (seen here with Chelsea Handler in Park City) told TheWrap: "I am going to march. I have a film at Sundance and there's a march planned there, I'm going to march, and use my voice, and stand up. It's no longer sufficient to sit behind your computer or just watch as events unfold. Your civil liberties are not necessarily guaranteed and you must learn to fight for them each and every day." Actress Rebecca Hall British actress Rebecca Hall addressed a crowd outside the U.S. Embassy in London during the Women's March. Emma Watson joins the crowd in Washington, D.C.
Filmmaker Peter Bratt and his actor brother Benjamin Bratt spoke out at the Women's March in Park City, Utah. Anjelica Huston joins the crowd at the Women's March in Los Angeles. Jessica Biel joins the crowd at the L.A. Women's March. Actress and musician Juliette Lewis protests at the Women's March in L.A. Artist Shepard Fairey and actor James Franco attend the Women's March in Los Angeles. Miley Cyrus takes a bite out of her protest sign at the L.A. Women's March. Vanessa Hudgens holds a sign at the L.A. Women's March. Connie Britton addressed the crowd at the Women's March rally in Park City, Utah. Julia Louis-Dreyfus addresses L.A. crowd. One of the youngest celebrities taking part in the march is Yara Shahidi from "Black-ish," which just aired an episode addressing Trump's victory. She was joined by her co-star, Tracee Ellis Ross, who had said her schedule would prevent her from attending. Jane Fonda spoke at the Los Angeles Women's March, but first she will promote it with an interview on "Real Time With Bill Maher." Oscar-winning documentarian Michael Moore may have predicted Trump's electoral win but he still joined the protest in Washington, D.C.
Singer Kesha joined the L.A. protest, complete with a sign criticizing Donald Trump's sons. Another teen celebrity attending is "Girl Meets World" star Rowan Blanchard. The 15-year-old actress will speak prior to the Los Angeles Women's March at Pershing Square. Rufus Wainwright performed at the L.A. version of the Women's March. Mary Steenburgen carried a handmade sign at the Women's March in Park City, Utah. Natalie Portman speaks in downtown L.A.
TV producer Deena Katz and Jamie Lee Curtis at the L.A. Women's March. Helen Hunt joins crowd in L.A.'s Women's March. Debbie Allen and Kerry Washington enjoy a moment at the Women's March in L.A.
Katy Perry donned a yellow beret and marched in Washington, D.C. She had performed at the Democratic National Convention and allowed Clinton to use her song "Roar" in a campaign ad. "Top Chef" host Padma Lakshmi told Rolling Stone she planned to attend the march in D.C.: "I am offended on behalf of Mexicans. I am offended on behalf of Muslims. I am offended on behalf of everything that this country and the Constitution stands for." Samantha Bee openly supported Clinton on her show "Full Frontal" during the primary and general elections. She also planned to join the D.C. march. Lupita Nyong'o, who has a history of appearing at women's health rights rallies, also planned to march in D.C.
Zendaya posted a painting promoting the D.C. March on her Instagram account. Cher was also at Clinton's election-night event and became known for her intense anti-Trump tweets last year. 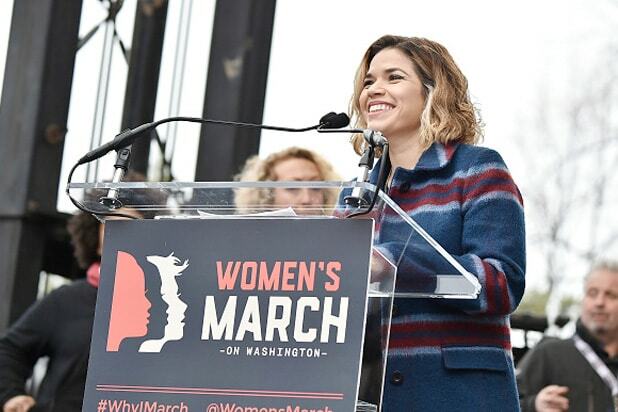 Her participation in the D.C. March was announced through its organizers. Olivia Wilde has been an avid promoter of the March on Instagram. "We work peacefully while recognizing there is no true peace without justice and equity for all," she wrote in a recent post. "Join the movement! Men are welcome!" "Absolutely Fabulous" star Mo Gaffney told TheWrap she planned to go to the Washington march after spending inauguration day "girding my loins, figuratively -- and literally because... well, Trump and grabbing." Julianne Moore, who called Trump's rhetoric during the election "incredibly detrimental to us as a society," also took part in the D.C. march. "Orange Is The New Black" star Uzo Aduba also planned to attend. Sheri Shepherd told TheWrap she will be at the Los Angeles march: "I'm gonna be there! I've got my flats and my heels."